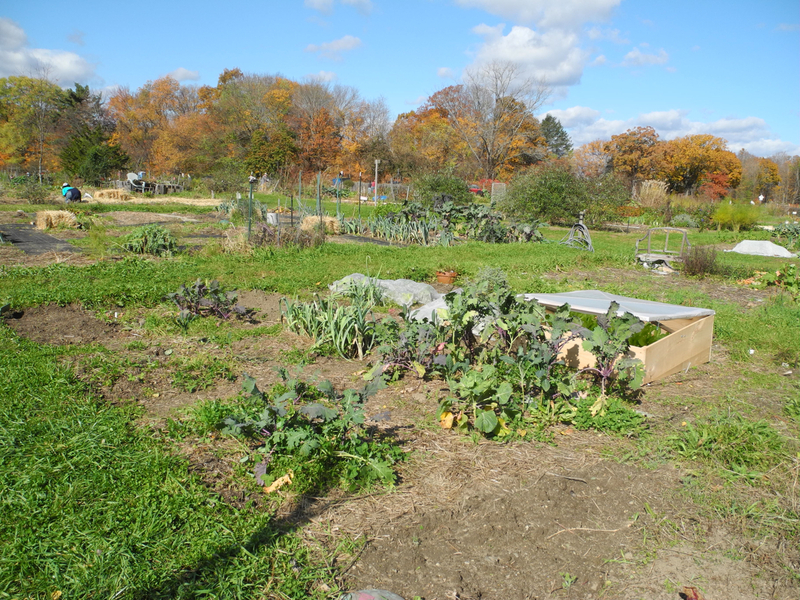 As the end of October approaches, the garden has been more or less put to bed for the winter, but there’s still quite a bit growing. The Friday before last a frost was predicted, so I went over to the garden and picked one last bouquet of flowers, big bunches of herbs, and most of the chard. I didn’t quite believe that we would really get a hard frost, but that night the temperature dipped down to 25 degrees. The last of the chile peppers and beans and flowers were zapped, and even some of the kale had a little bit of frost damage. 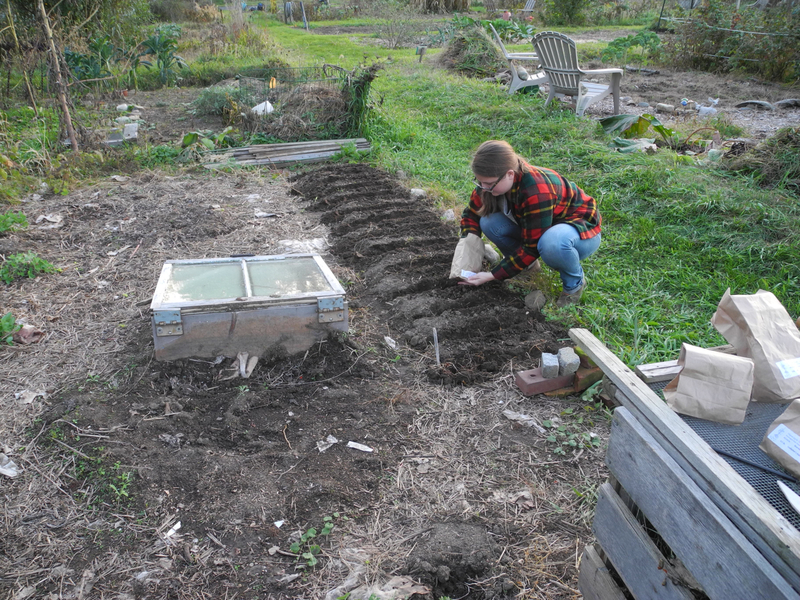 That weekend we finished clearing out the most of the beds, and prepared two big beds for garlic. The garlic went in the ground last Wednesday, over 100 cloves of 4 different varieties. I may have gone a little bit overboard, but I don’t think you could ever have too much garlic. Maybe everyone will get garlic for Christmas next year. 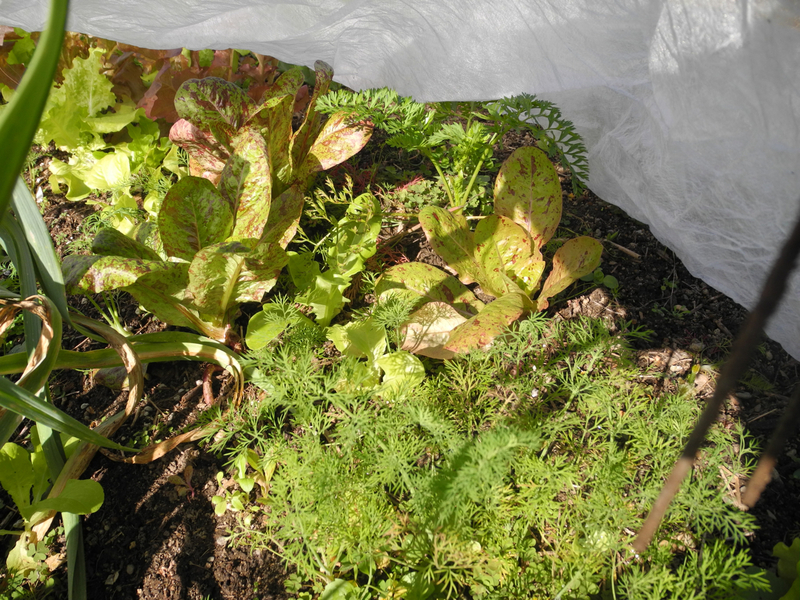 Before the frost I put a row cover over the lettuce, and it’s nice and cozy under there. The lettuce didn’t seem to be bothered at all by the cold, and when I peeked under the fabric yesterday I couldn’t believe how much it had grown. One of the new cold frames is in place over a bed of mustard greens, chard, tat soi, and carrots. The second cold frame isn’t quite ready yet, but when it’s finished it will go over another bed planted with lettuce, chard, arugula, spinach, and parsley. There’s also still plenty of kale and leeks, so I’m hoping we’ll be able to keep eating from the garden til it’s all buried in snow. Posted on October 22, 2012 by kate. 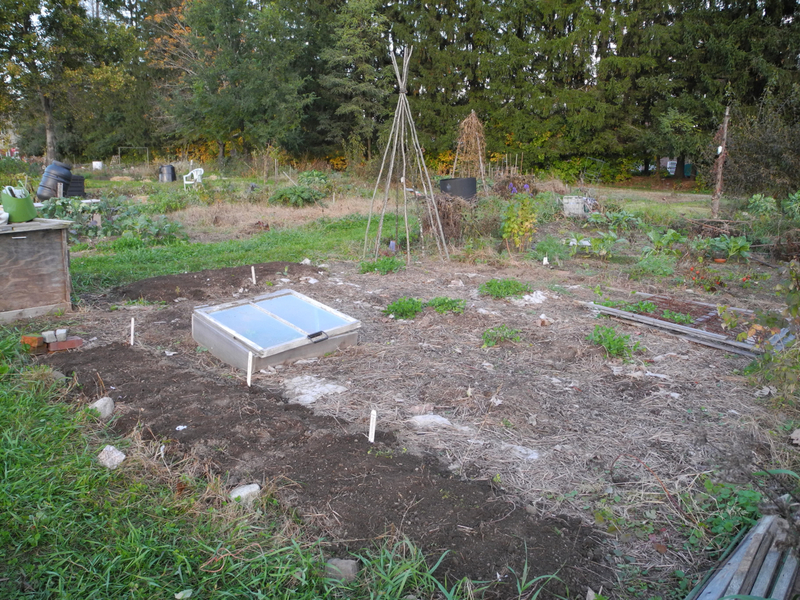 This entry was posted in Gardening and tagged cold frame, fall, frost, gardening, garlic, greens, lettuce, October. Bookmark the permalink. Thank you for reminding me to get going on the garlic! Yup, I have hard neck and soft neck, so I should be pretty well supplied next year. Better too much than too little, right!? 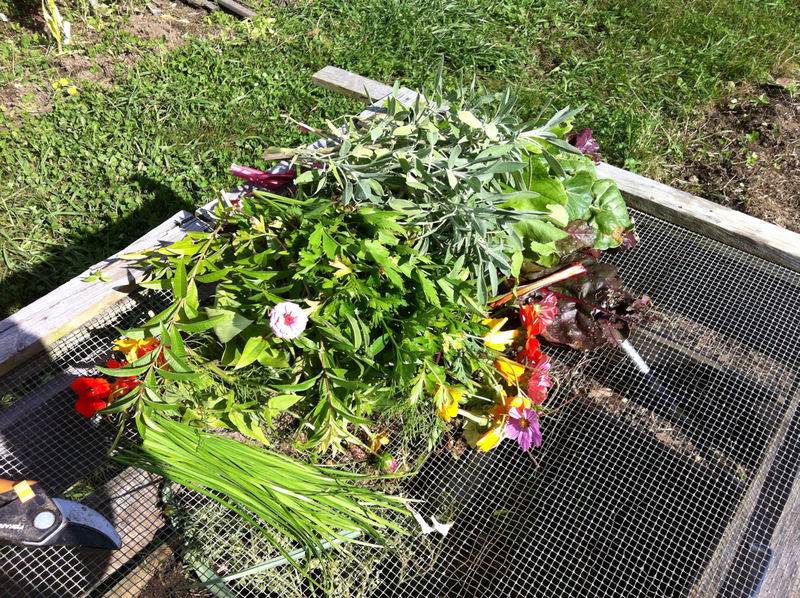 I love your cold frames too; a great way to extend the season for greens! It was really fun having a look round at everything in your garden. I’m just about to put our garlic in too. Thanks! I’m excited to still have lots greens even as it starts to get colder. Thank you! I’m sure you’ll find some windows sooner or later. You always find the best stuff at the dump! you are so right, you can never have enough garlic ! 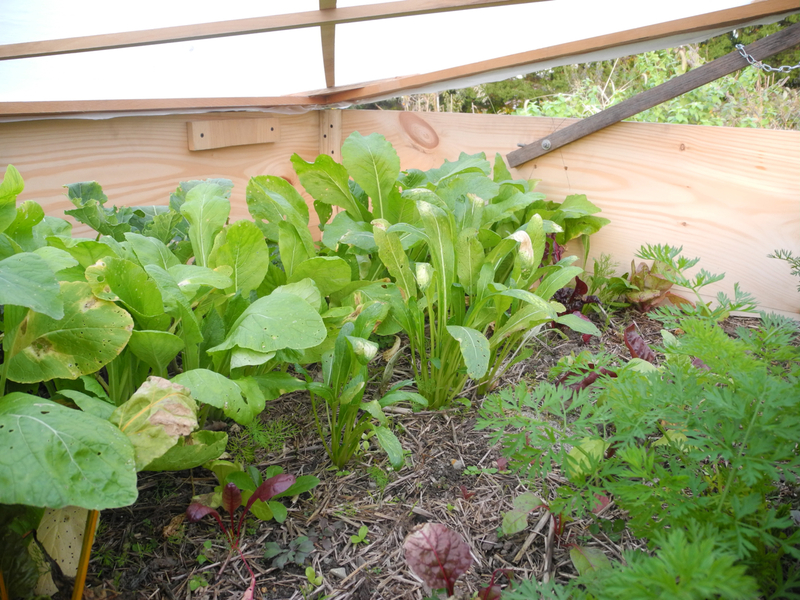 And your cold frames look like they are doing a great job, it’s on my list of projects for this winter……. Like others have already said, I think 100 cloves sounds great! I also am growing 4 varieties, but not near 100 cloves. I should probably strive for that next year.